If you’ve ever been put out of action by an injury, you’ll know how infuriating, debilitating and strangely isolating it can be. I’m sharing my experience below in the hope that it brings some comfort and reassurance that the situation (or at least your response to it!) can and will improve. 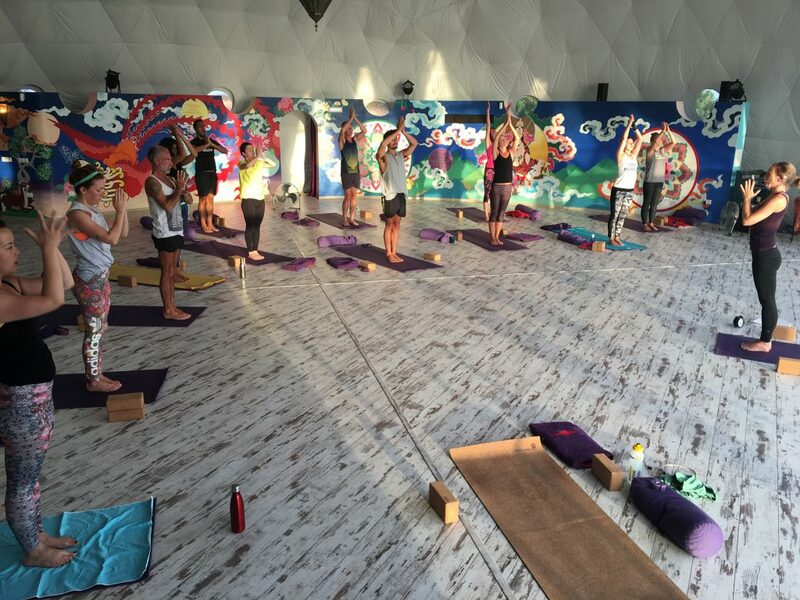 Three months ago, I taught what was from my perspective, my worst ever yoga class. 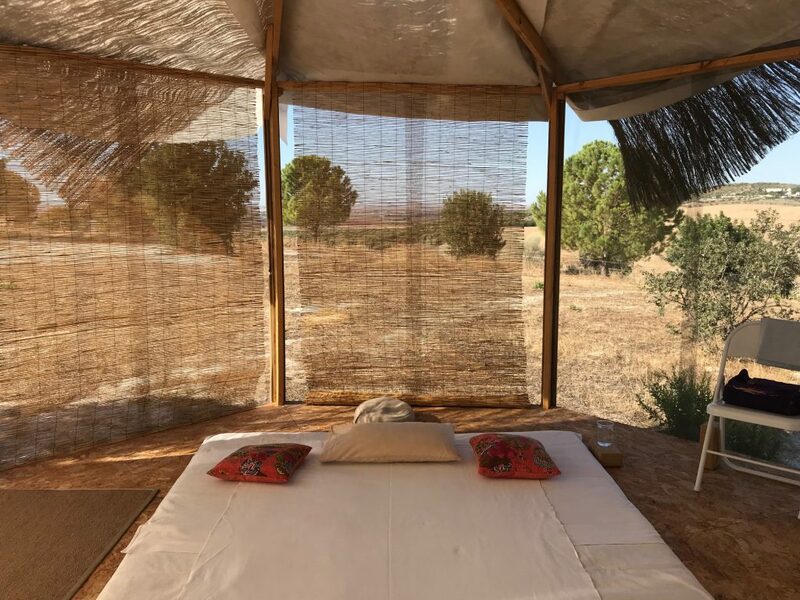 It wasn’t that anything went wrong with the class itself (though it wasn’t without challenges – a last minute room change and a power cut to be specific). No, the issue was that when demonstrated cat-cow, something in the right side of my lower back “went” sending searing pain through my back. I’ve had lower back issues before, so I knew this wasn’t good, but I carried on teaching, hoping that moving would help. It didn’t. By the end of the 90 minute class, I was in barely disguised agony. I remained in acute, debilitating pain for the next three weeks. The only position that was comfortable was lying down. Sitting, walking and standing all sent my muscles into excruciating spasms. Safe to say, it was the end of my yoga teaching, and indeed my yoga practice for quite some time. As I said, I’ve hurt my back before, and quite badly, but this was worse. What made it emotionally harder was knowing that I’d hurt it doing yoga. Whereas previous injuries (through doing the Insanity workout programme, lifting kettlebells and most embarrassingly, tripping over the wire while straightening my hair) I could attribute to a specific, avoidable incident, what triggered this seemed so innocuous. It wasn’t even as if I was attempting a challenging posture. I had some good advice and some terrible advice. Friends plied me with hot water bottles, ibuprofen and gin (which somewhat worryingly helped more than painkillers!). I scoured the internet obsessively in the hope of a cure, and in my desperation forked out for not one but three eBooks on healing back pain, which I read from cover to cover. The worst of these convinced me that the pain was wholly psychological in nature and that once I knew that, all I needed to do was return to my normal activities. Full of hope, I walked the 5km to the local town, determined to “act normal”. By the time I got there, I was in so much pain that I passed out on the street, and came round surrounded by a group of lovely, and deeply concerned Spanish locals. Not cool. So for the next six weeks, life revolved around things that didn’t aggravate my back. I wanted to keep up some kind of self-practice, but how I felt about yoga had changed. Rather than being my therapy, my healing and my safe refuge, yoga felt risky. I considered meditation but this was hard as I couldn’t sit still for more than 20 seconds, and meditation lying down for me is just falling asleep. Instead I started to read books on Buddhist philosophy and practice, which helped a lot more than the back pain books did. They encouraged me to develop a less combative relationship with the pain. I also began very gentle and cautious mobilisation and breathing exercises. Slowly, slowly I started to build up the distance I could walk. 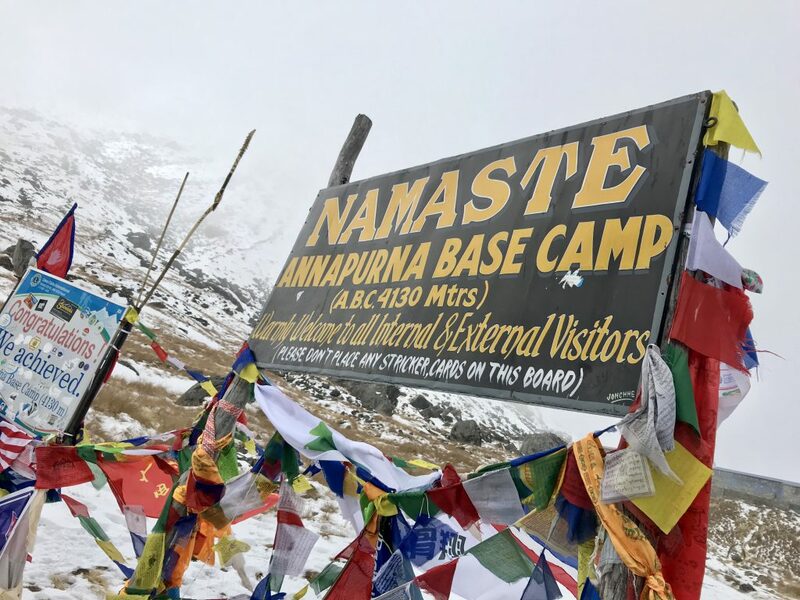 This was going well, but I feared not well enough, as I had booked to do the Annapurna Base Camp trek at the start of December – 9 days of arduous trekking in the Himalayas. I was nervous to say the least. But the flights were already booked, and ABC had been a personal dream for the last 11 years, so there was no way I was going to not try. I won’t bore you with every detail of the trek – my poor friends and family have had to put up with that a lot lately! But I’m very happy to say that it was every bit as incredible as I’d hoped. It wasn’t a painless experience, far from it, but the more I walked the more my pain eased. I was filled with immense gratitude for what my body could do. Not only that but the walking itself was an incredible exercise in mindfulness. Because you have to place your feet carefully for each step (to avoid falling off the mountain) it was impossible to think about anything else. 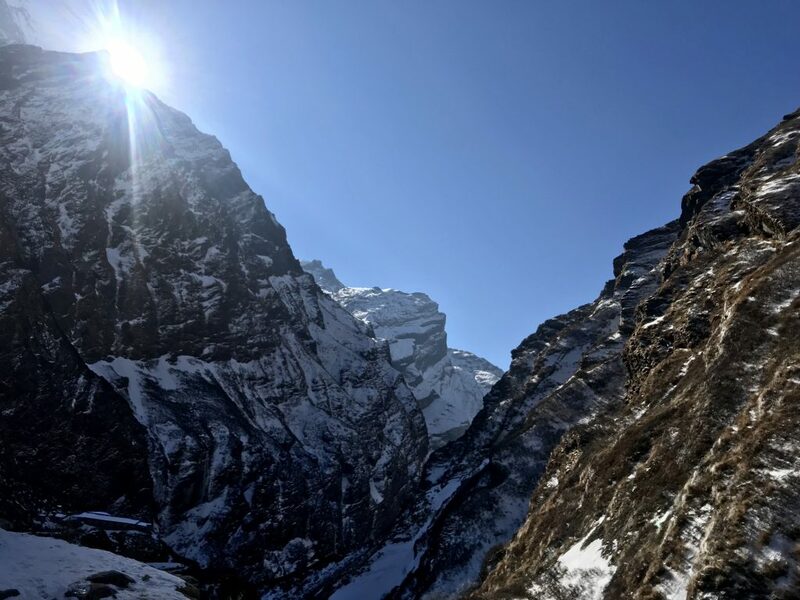 That coupled with the digital detox – we spent the whole trek without connecting to WiFi – meant I finished the trek feeling calmer, happier and more present than I have in a long time. But still no yoga. I played with a few postures after walking some days, but they didn’t feel great in my body, and I didn’t want to risk it. Then came new year. 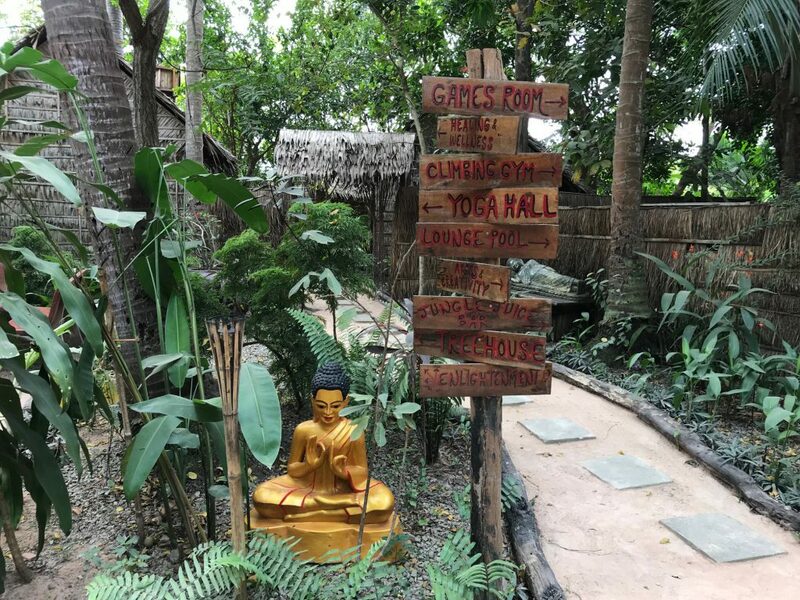 We attended a yoga and meditation retreat in Cambodia. My first yoga class there was a nerve wracking experience. Although the practice was gentle, I felt flashes of huge anxiety, and sometimes intense anger when a posture affected my back. I didn’t love the yoga classes, but in hindsight they did help me to overcome the mental barrier I had to practising postures. But the meditation made a more tangible difference. By then I was able to sit on a meditation bench for around 30 minutes without pain. This time daily to connect in with myself and my breath let me put into practice all the learning from the Buddhist books I’d been reading. There was also a strong emphasis on the importance of self-practice throughout the retreat, which I took to heart. Since coming back from the retreat, I’ve developed a more consistent self practice of yoga, pranayama and meditation than I’ve had for years. I practice daily, around 30 minutes of postures, followed by pranayama and meditation later in the day. My practice doesn’t look the way it used to – currently my most “advanced” posture is tree pose (which I love!) – but it feels better. More honest, more connected and more grounding. It may be a while before my yoga practice looks like this again! But suffice to say for now, coming back to yoga has been a process of gradually getting reacquainted with my body again – feeling into where the edges are now, and where I can use my breath to open up spaces. I’m experiencing again the joy of when I first discovered yoga, each posture as an invitation to step into myself as if for the first time. I’m building up confidence and trust in my body once more, and I know that’s going to take time. For once, I’m actually very happy to give it that time. Want to make sure you don't miss a thing? Enter your email address to subscribe to this blog and receive notifications of new posts by email.